I remember the first time I ever saw a halo engagement ring. My best friend at work had one on THAT finger, and I recall thinking ‘omg, that ring is out of control.’ All in the best ways possible, of course. It was cushion cut, with a halo of stunning pavé set diamonds - and it literally took my breath away. Now, for me, the halo was just a bit overwhelming; because my fingers are long and thin, I needed something a little simpler and daintier for my engagement ring, but my love for the look is still 🔥🔥🔥. And La More Design doesn’t just do high-impact halos in one-and-done ways, instead, the vintage-meets-modern jewelry mavens have two haute halos to please both classic and creative brides. Let’s do a little side by side comparison, shall we? La More’s Luna Halo is on the bottom left, the Tiara Halo is on the top right. They both feature a black center stone, surrounded by natural diamonds, but you’ll see that the diamonds are set a bit differently on one versus the other. According to the designers, Luna’s halo diamonds are set symmetrically to achieve a gorgeously harmonious look - Tiara’s halo diamonds are set artistically to create a majestic effect. They both can be custom made with various shapes of center stones (pear cut, oval, round, etc.) and a myriad of diamonds and gemstones. That being said, maybe it’s just my mood for today, but I’m all about the Tiara. Also, anything that remotely conjures up princess thoughts in my mind, gets extra points. That’s just how it is #wannaberoyal. So, halo lovers, have any clue what’s more you? Like we said, we don’t love either one [la] more - they’re both amazing - but we put a little 'either-or' quiz together for your pleasure. Count up how many 🌙 or 👑 you have at the end, and we’ll see where that puts ya! How you feel about symmetry. When it comes to your palette persuasion. Preference for a pavé halo? How you feel about that center stone. If you’re more 🌙, then you should take a look at some of LMD’s Luna rings. 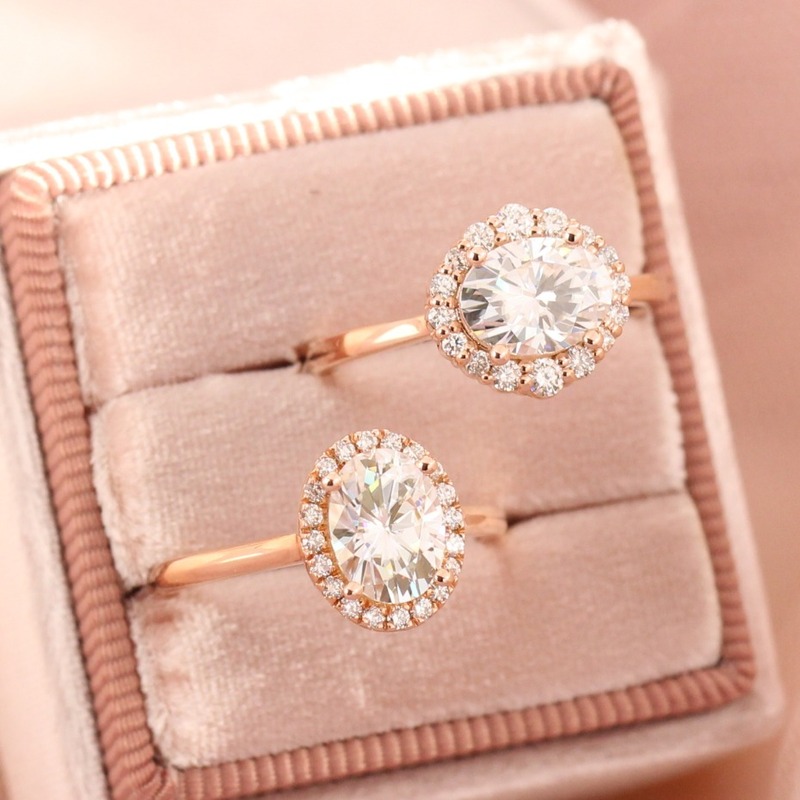 They feature a center gemstone or moissanite surrounded by dazzling natural diamonds for a chic sparkling look. It’ll be finished in either a simple, plain gold band or diamond band for a high-wattage finish. If you’re more 👑, then you should peep the Tiara halo types. 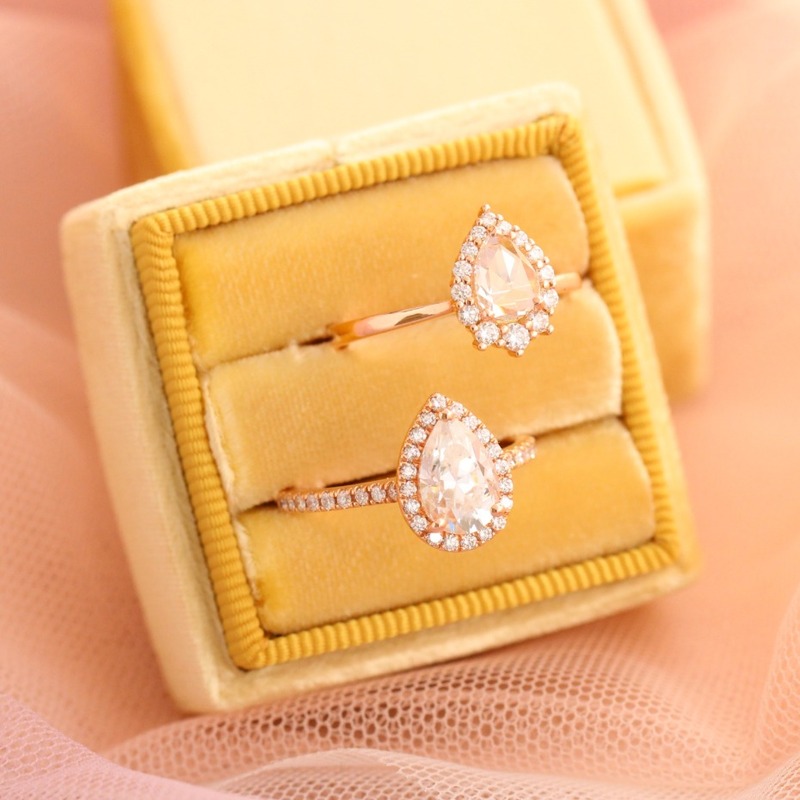 They feature a stunning center stone of rose cut diamond, moissanite or sapphire set beautifully for a majestic effect! Want to take it a step further? Celebrate your love with one of their tiara engagement rings and then pair it with one of their diamond wedding bands as a halo bridal set. Honestly, though, no matter which halo you have your eyes on, La More Design will do the most with your 😇 vision. Shop their Luna and Tiara Halo Rings now and keep up on IG for more snaps of these sister styles. We partnered with La More Design to bring you all the highlights of their halos! As always, thank you for supporting our sponsors!